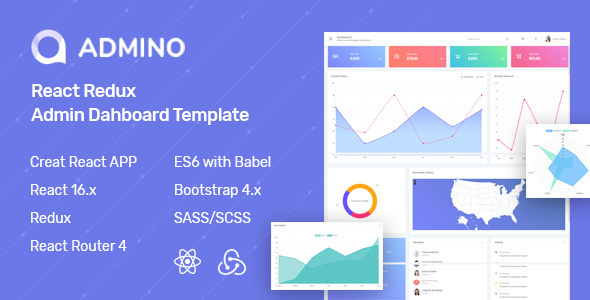 Admino is a Single Page Application React Admin Dashboard Template where we have been used Redux technology for Data and State Management. It is Rect Redux Complete Admin Template having Material UI for maintaining primary UI but Admino has lot of Custom Components that makes it different. There are some unique features that makes Admino different like Mail Apps, Complete Form Apps UI, Customized Charts for Business Statitstics, Several Maps UI and other components. Admino has 38+ highly customizable components and those are supports responsive layout. Admino is the great choice for those who is looking for Cool User Experience. And we are eagerly waiting to introduce and help you to grow your business.